Automate your marketing with Messenger Bots and Facebook Ads by creating some powerful strategies that grow your business. 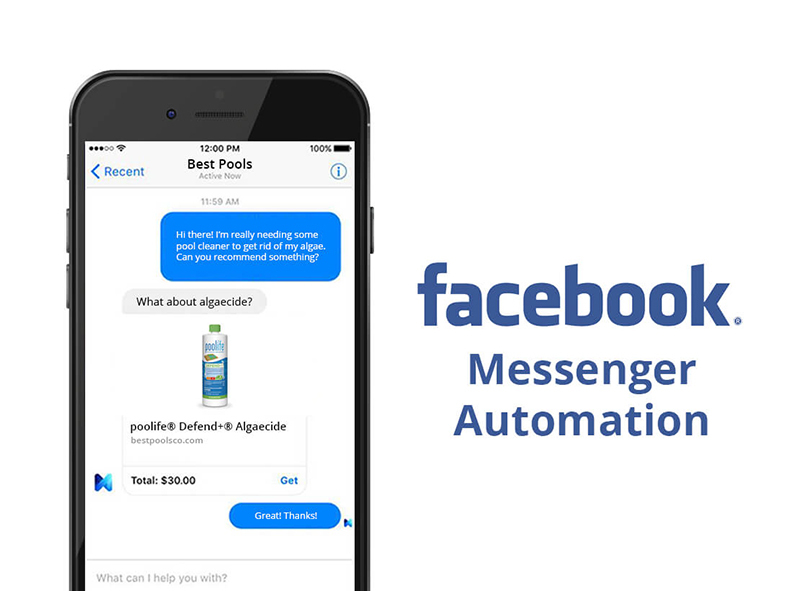 You’ll be able to reach and engage current and potential customers in Facebook Messenger using our tested, proven advertising solutions for your pool and spa business. We build interactive voice and text-based conversational interfaces that empower customers to engage with your business in their preferred messaging platform. Facebook now lets you install Messenger chatbots on your business page. Chatbots allow you to have an automated conversation with people who click on your Facebook Messenger to start a dialogue. With Facebook chatbot marketing, the messages you receive can be easily customized based on the links you click as you progress through the message flow. Setup the Basics. We’ll get your Facebook created (if you don’t have one) and ensure messaging is turned on. Have the Right Conversation. We’ll program these versatile AI tools to help you develop rich, interactive experiences that fit your unique business objectives. It goes beyond just messaging and drives conversations with your customers. Write Great Scripts. We’ll work with you to develop all of the possible questions a customer might ask and how they might ask them. Then we’ll create a variety of answers and interactions and test how they work. Get More Automation. Integrate your Messenger experience directly into your website. We’ll set up recurring messages for news, tracking or productivity. Drive Customers to Your Chatbot. Once we’ve created your first automated chatbot, tested it, and know it’s working properly, change the call-to-action button on your Facebook page to Send Message to drive traffic to your chatbot. Higher Conversion Rates. Filling out the form via Messenger is much easier and convenient for users than redirecting to a website just to do the same thing — remember, 90% of people on Facebook use mobile devices. Better Follow Up. Using this messaging system allows you to follow-up with everyone even if they don’t send you their phone number or email. Better Customer Service. Messenger allows customer support without switching to another channel to get information about your products or services. They can ask questions and receive a response immediately. Make it Personal. Messenger is a much more personal way for communication. The bot flow can be changed right while chatting. A Bot can know the name and some previous history in the communication. The landing page can’t. Get Automated. Chatbots send content to your users automatically, based on the actions they take. >More Exposure. Reach your customers by integrating Messenger as a conversation destination into your marketing strategy.